Business hours: 6.30am to 11pm daily. THAT which is small and edible describes the versatile tapas, and at The Restaurant, a plethora of flavourful bite-sized treats awaits to be discovered. The Restaurant’s interior of wood and glass is warm and pleasing, just like the tapas selection introduced by chef de cuisine Ryan Arboleda, 34. At the core of his new menu, are contrasting yet complimentary elements that fuse traditional and contemporary techniques with cross continent flavours. New Zealand-born Arboleda fits together pieces of the puzzle that make up his 14 years of experience, largely influenced by the flavours he picked up while working in Thailand and the defining characteristics of Australian food. 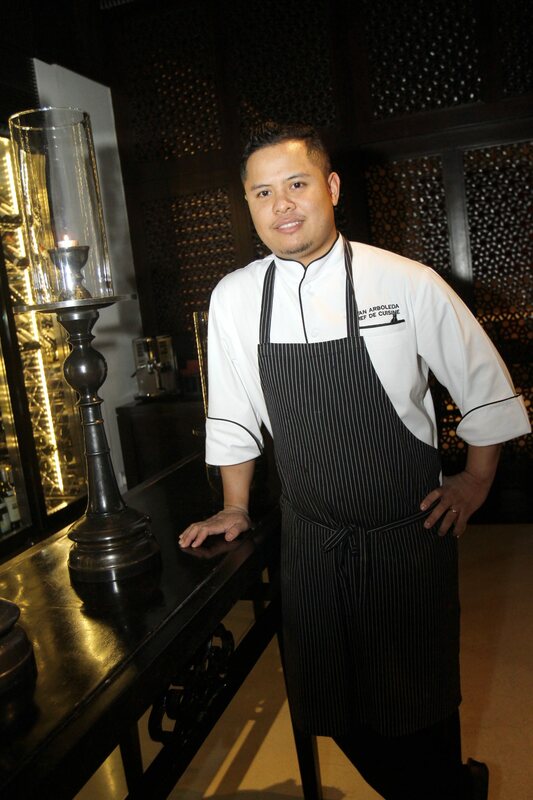 New Zealand-born Arboleda has 14 years of culinary experience under his belt. “I wanted to present authentic flavours, not just give you tourist food. “I want to show people the authentic side of what I’ve actually learnt,” said Arboleda who joined Saujana, recently. To start our journey of indulgence, Arboleda presented an appetsing tasting tapas platter featuring Steam Bao, Char Grilled Beef, Hoisin Sauce Mung Bean Salad (RM19) and Thai Chicken Larb “Tacos” Mint, Toasted Rice Dressing (RM19), as well as raw Salmon Tostada, Green Papaya, Guacamole, Chilli (RM25). 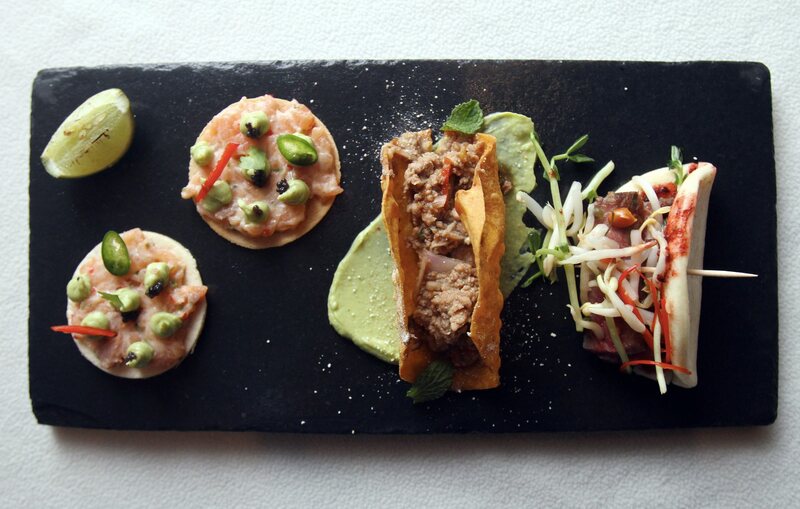 (From left) Salmon Tostada, Green Papaya, Guacamole, Chilli; Thai Duck Larb ‘Tacos’ Mint, Toasted Rice Dressing; and, Steam Bao, Char Grilled Beef, Hoisin Sauce Mung Bean Salad. The fluffy steam bao came with a range of textures with succulent beef complemented by the rawness of the salad, then doused with sweet saltiness of hoisin sauce, conventionally associated with duck. Again mixing up conventionalities, the South American inspired tacos was filled with larb, a minced meat offering found in Laos and Thailand. This flavoursome treat went by all too quickly. ‘Som Tum Poo’ Fresh Green Papaya Shreds, Peanuts, Blue Swimmer Crab (RM25) that chef de cuisine Ryan Arboleda switched with cod fish for the tasting. 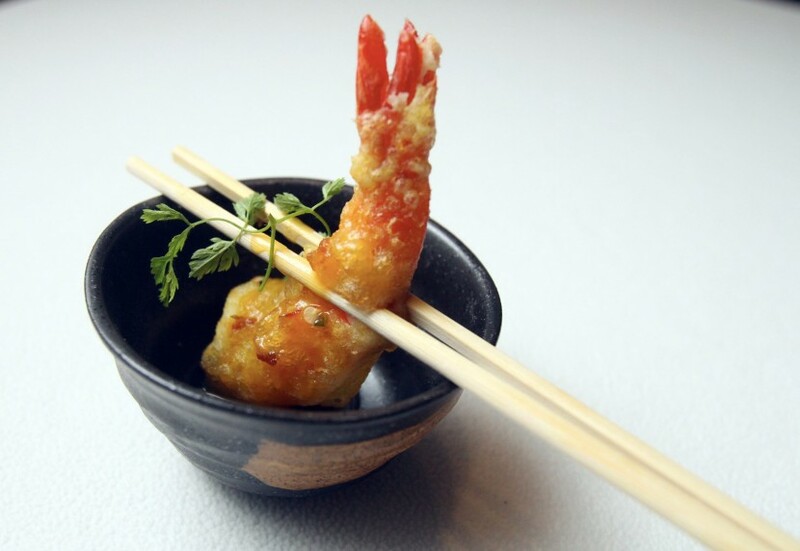 The Spiced Tempura Prawns, Passion Fruit and Chilli Coulis (RM22) is a crisp prawn dish that melts in the mouth with sweet and sour hints of tropical flavours the moment you take a bite. 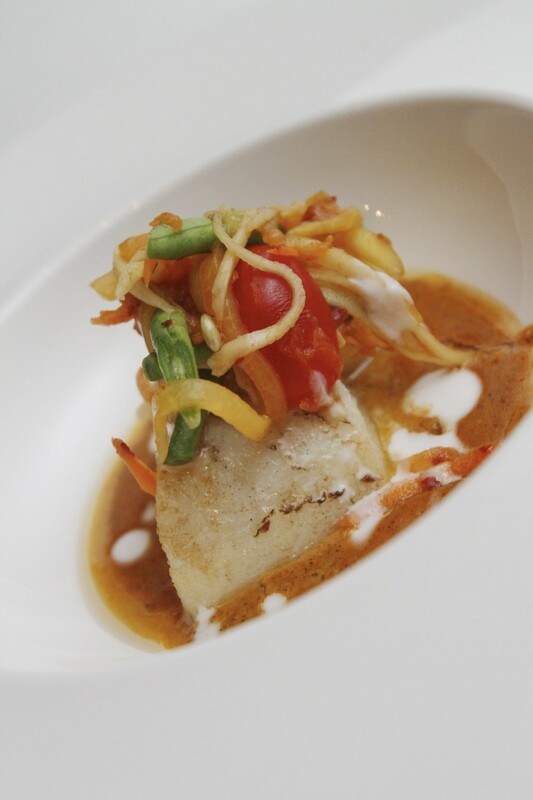 One of Arboleda’s favourites is the aromatic “Som Tum Poo” Fresh Green Papaya Shreds, Peanuts and Blue Swimmer Crab (RM25) but for our tasting, he opted for cod instead of the crustacean. The delightful som tum was the perfect salad to go with the cod which sat in savoury Massaman curry. “The Massaman which is my favourite curry, is quite unique. Spiced Tempura Prawns, Passion Fruit and Chilli Coulis, with the tempura prawn wrapped in sweet, slightly tangy sauce. “In Thailand, meat is usually used but I chose to use seafood instead. “I garnished it with som tum because it is a street food that you can find anywhere in Thailand and I love its sweet-sour notes, its texture and I was addicted the first time I tried it in Thailand,” he said. A dish that holds no punches was the Seared Scallops with Chu Chee Sauce. It was surprisingly spicy, with the heat slowly creeping up and sitting on my tastebuds, but slightly mellowed by the sauce’s creaminess and green apple shreds. 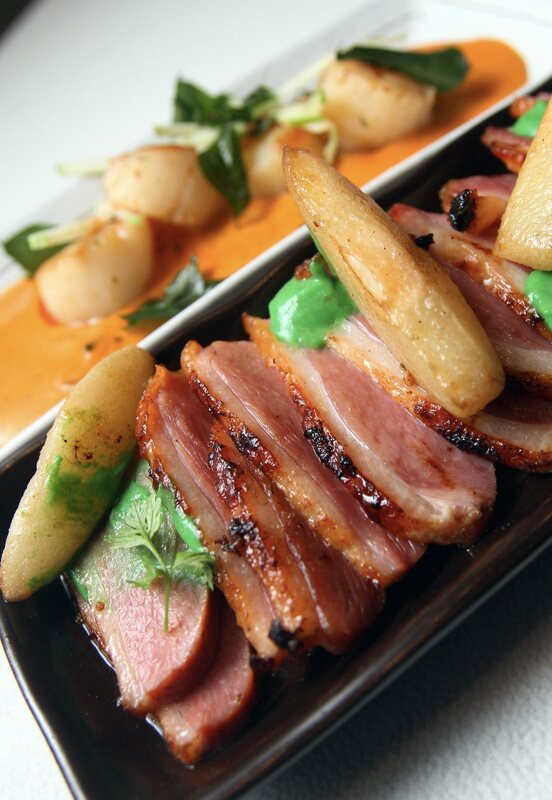 The subtle flavours of Korean Duck BBQ served with Grilled Pear and Kim Chi combined with Roasted Broccoli Puree (RM42), portrayed Arboleda’s fusion of Western technique to Asian flavours that was obvious in the tapas menu. The menu is available from Tuesdays to Saturdays from 5.30pm to 8.30pm.